Robert V. Ostler Park is a community park that is favored by the locals and tourists as a picnic spot. Robert V. Ostler was the Mayor of Campbell River after whom this park was named. This waterfront park features many facilities for the visitors like picnic shelters, playground, viewing benches, washrooms, a rocky beach, and a grassy lawn. 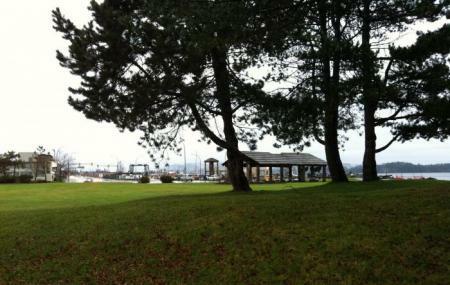 One of the main features of the park is Campbell River Seawalk running through it. Has a very cute playground. It's right off the ocean and quite often when you sit on the benches looking at the water you can seals playing in the marina. It has two bathrooms which are usually pretty clean. I really like this little Park. Great playground. Fantastic ocean views. A great park with amazing views lots of services close by. Good for ages 1 thru 10. Beautiful spot on the shore of discovery passage.